Cuetec cues were founded in 1989 and became an overnight success. Using an original design which now patented, Cuetec literally re-invented the pool cue by eliminating common problems such as warping and dents but most important was able to bring down the cost of pool cues into a very reasonable price point. Cuetec has enhanced its world famous Pro Taper to become the strongest in the industry with S.S.T. Design (Super Slim Taper). 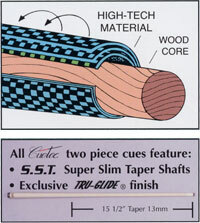 This new dramatic 15 ½” conical taper coupled with the new “Tru-Glide” super slick shaft finish which aimed to ensure it will be long-lasting and maintain its slickness, both based on a high quality hardwood core, deliver the strongest, smoothest, and most solid hit available which associated with high-tech composite materials, yet the feel of wood. Over time, even the most expensive cues you can imagine can be ruined by atmospheric conditions such as temperature and moisture. Cuetec’s “Power Bonding Process” protects the cue from warping by locking out moisture and temperature changes. In addition, the synthetic cladding provides ding and dent resistance, and adds tremendous strength to the cue. Start with the best available Canadian Hard Rock Maple Inner Wood Core for a sure solid hit, Cuetec then power-bonded with resilient layers of Fiberglass or Graphite with the state-of-the-art construction equipment and techniques. Available in a large variety of beautiful colors, finishes and unique designs, Cuetec is aimed to provide wide product range to satisfy players. Also with features such as Adjustable Weight Bolt Systerm, Smart extension and Tiger Tips there’s a Cuetec styled to please every taste. Cuetec Pool Cue Care Tip: You may use a slightly dampened soft cloth or paper towel to clean your billiard cue. The type of cloth that is best suited is the type used to clean eyeglasses. Do not use any abrasive cleaners, any caustic or volatile chemicals or any kind of shaft slicker/smoother as you will strip the finish and void the warrantee. 5 Main Reasons to buy Cuetec Pool Cue! Completely sealed from atmospheric conditions -- with the POWER BOND moisture barrier. Brute strength -- Fiberglas delivers the durability, the wood provides the solid hit. Super-slick pro tapered shaft -- treated to stay smooth without sanding. Dirt and chalk can be wiped away with a damp cloth. Professional features and performance at low cost -- stainless steel joint, Le Professional tip, permatized grip. Copyright © Comet M-One Sdn. Bhd. All Rights Reserved.